……….. it is not the sponsors or products that are best remembered. 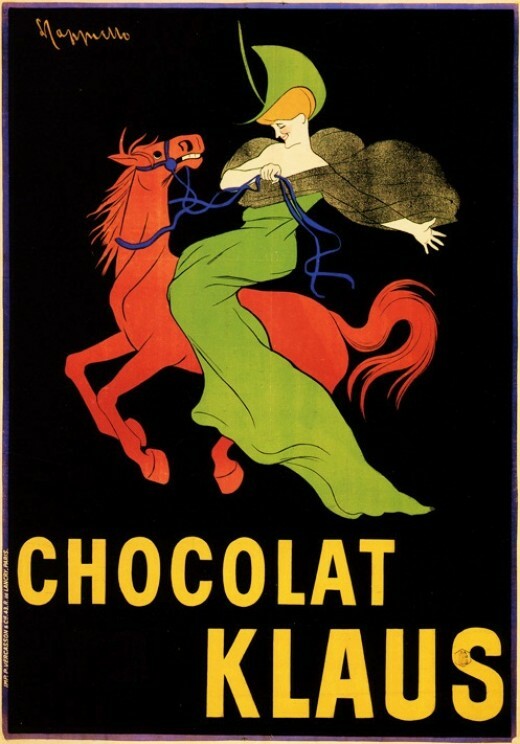 The style that changed the look of commercial art nouveau posters forever. Before that time, advertising posters looked a lot like classical paintings, with carefully detailed backgrounds . 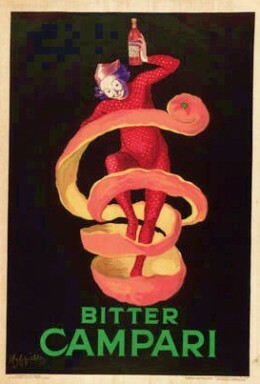 Cappiello’s posters had the focal point of the work standing out from a dark background, to better emphasize the theme. ……. as if the subject was captured in the middle of some interesting activity. The colors were lively and in definite, stark contrast with the backgrounds. 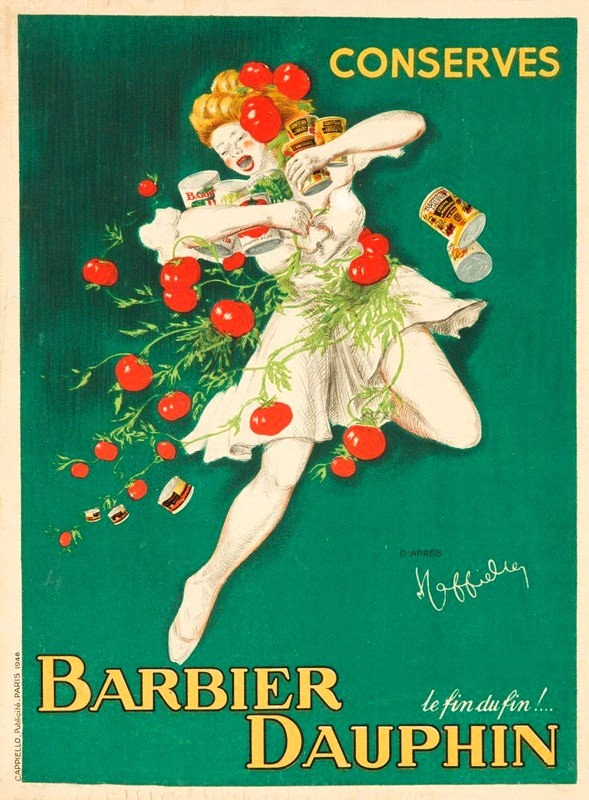 And Cappiello didn’t just do advertising art …. ” the greatest composer of Italian opera after Verdi”. ” the most famous actress the world has ever known“. 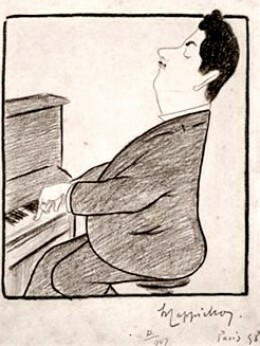 His caricature of his fellow Tuscan Puccini, in fact, was the first work of Cappiello’s that got published. Two of his best known caricatures were of the French actresses Jeanne Granier and Marthe Mellot. Cappiello had learned his art by doing portraits. He had learned to paint without formal instruction, and originally he preferred painting landscapes…. One of his paintings from this period was shown at an exhibition in Florence in 1892. 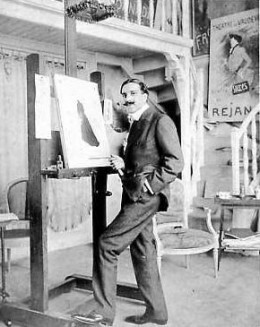 In his teens he turned mostly to portraits, and from there to his caricatures. and ‘Le Miroir à Deux Faces’ by Jacques Boulenger (1933). ….as beautiful as they are, are overshadowed by his extraordinary poster art. 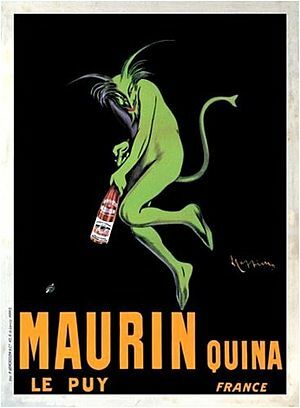 He created over 500 commercial posters in his career, and one would be hard pressed to choose ” a top ten best “. I can tell you it was very difficult choosing only a few of my favorites. Thus, I had to leave out a number of wonderful works. 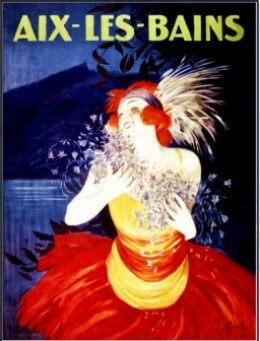 You can see Cappiello’s work in my post on the Art of La Belle Epoque, and on my Coffee post, as well. with his brilliant design for ‘Chocolat Klaus’. 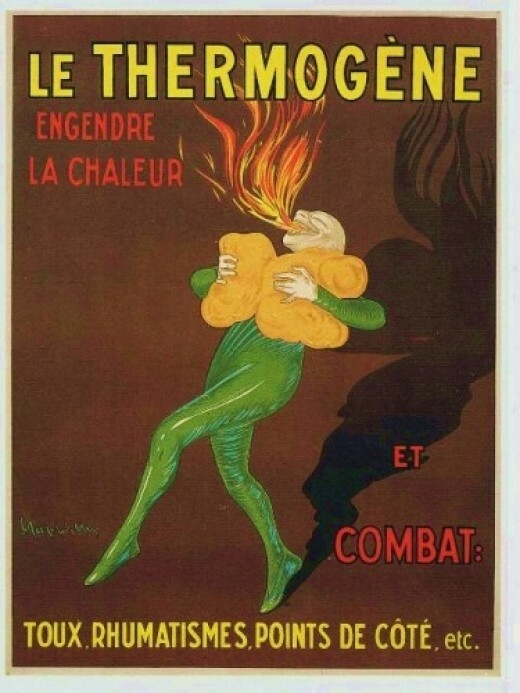 Posters for ‘Maurin Quina’ and his famous ‘Thermogene’ in 1905. And advertisers were literally bashing down his door to contract his work. ….. having published his last group of them, ‘Les Contemporains Célèbres’, in 1904. ……………. and his famous one of Henri De Regnier was first exhibited in 1910. 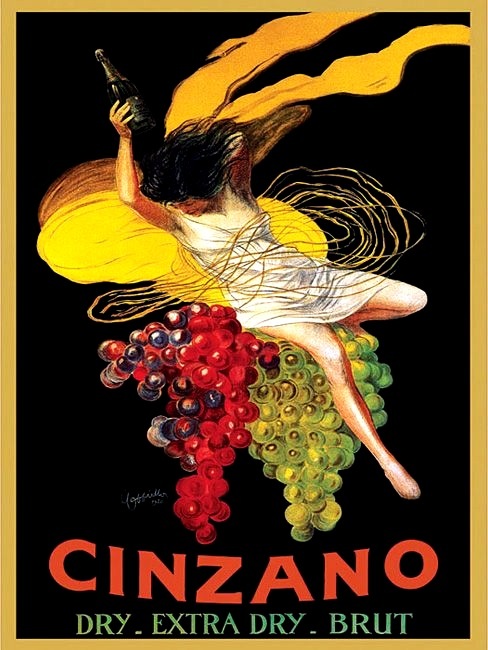 1910 was also the year for another landmark poster — for ‘Cinzano’. And he would complete a series of them for Cinzano over the years. 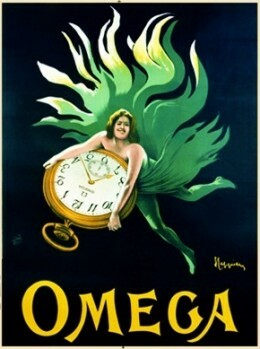 His most productive period, between 1910 and 1930, saw Cappiello produce original works for over 300 posters…..
………. when producing so many different pieces of art. But if you could quantify it into a number, it would be an astronomical one. …………… and you’ll see his work. ……………………… you’ll know who did them. 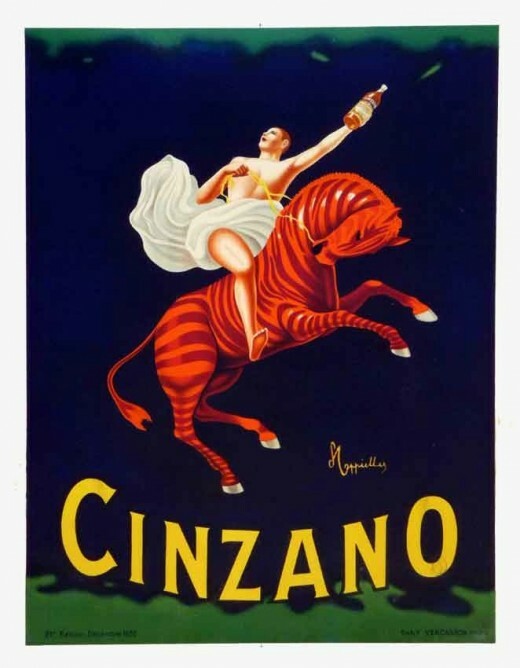 This entry was posted in Art, Entertainment, History, Pin Ups, Uncategorized, Vintage and tagged Advertising Art, Art Nouveau, Belle Epoch, Campari, Cinzano, French, Italian, Leonetto Cappiello, Poster, Poster Art, Puccini, vintage. Really interesting artist, nice post, thank you. In case the pingback went awol, which looks the case, I pressed this on FND this morning: http://wp.me/p1mFAV-2Wr Have a lovely week! A great pleasure. Much thanks for following First Night Design.